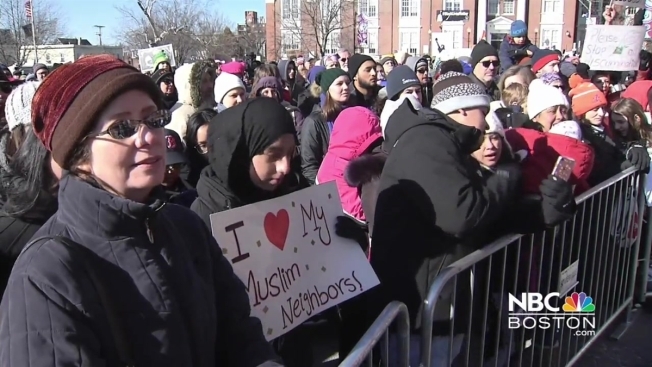 Hundreds of people attended Saturday's Sanctuary Cities and inclusion rally in Somerville, Massachusetts. The rally, hosted by the city of Somerville and The Welcome Project, started at 10 a.m. outside of Somerville High School. The purpose was to stand in solidarity with and in support of the city's commitment to its residents while remaining a sanctuary city. "I'm going to stand up for them, this is a sanctuary city and we are going to protect with all we can to make sure our families don't get separated and that the integrity of Somerville doesn't get destroyed," says Bambi Best of Somerville. Somerville Mayor Joseph Curtatone, Rep. Michael Capuano (D), and immigrant refugees were among those expected to deliver speeches. Curtatone vowed to maintain the city's status regardless of the cost. The rally also included performances by local music and dance groups. Somerville is among one of many cities that protects immigrants who are in the United States illegally. President Donald Trump recently threatened to cut off millions in federal funding to such communities. Many cities like Somerville and Boston have vowed to take legal action, arguing that the threatened punishment would be unconstitutional.